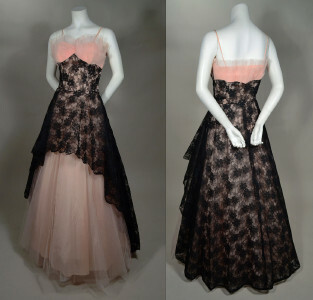 Marvelous 1950's vintage two tone evening gown. Pink & black tulle, black Chantilly lace and pink taffeta. Full length ball gown. Fitted & boned black lace over pink lining bodice forms point center front. Inverted three tiers pleated tulle at bust front and back. Pink taffeta spaghetti straps. Self piped at waist. Scalloped black lace over black tulle overskirt, short front gradually fashioned into slight train at back. Full gathered pink tulle underskirt. Full pink taffeta lining. EMMA DOMB has out done herself with this amazing gown! Bodice length, measured from shoulder at strap to waist - 17"
Skirt length, measured from waist seam to hem edge - 30"